Well.... we've taken a look at the best camera apps, best must have games, best must have apps, best free games and best weather apps for your Windows Phones. Now we turn our sights the independent game developer for the Windows Phone platform. They make code from their basement office or from a start-up company but some of these games can give the larger software companies (EA, Microsoft, etc.) a run for their money. We've rounded up a handful of games from the Marketplace's independent developers that we have found to be entertaining, fun, well presented and a worthy addition to anyone's Windows Phone gaming library. Breakrusher (trial/$.99): Breakrusher is a Breakout styled game where your paddle is raised and can be moved anywhere on the screen (you don't have to wait for the ball to come to you). The blocks slowly work their way to the bottom of the screen and there are plenty of bonus items (25) to earn along the way. If things get hairy, you can also destroy the blocks by hitting them with your paddle. There are 30 levels spanning four game modes and 30 unlockable bonus stages for plenty of gaming. There is a free trial version available with the full version running $.99. 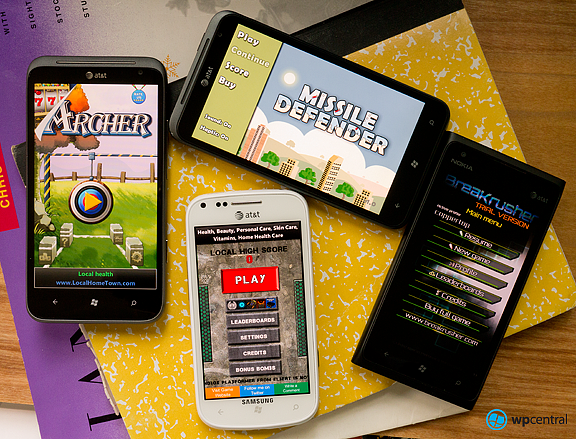 You can find Breakrusher here at the Windows Phone Marketplace. 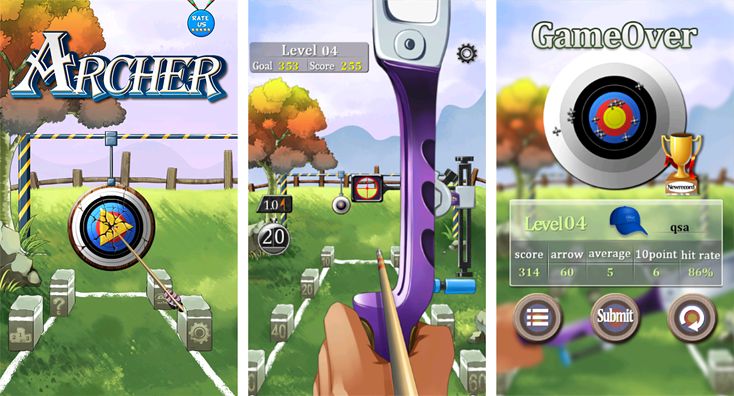 Archer (free): Archer is, as you would guess, an archery game that is simple, fun and well animated. The multi-level game has you shooting a bow and arrow to see how many points you can score in twenty seconds. Score extra time by hitting the bulls-eye and there is a Play vs. mode for a pass and play game amongst friends. Archer is a free, ad supported game for your Windows Phone that you can grab here at the Windows Phone Marketplace. MissileDefender (trial/$.99): MissileDefender is a nicely drawn out Missile Command styled game. You defend your city against alien missiles by shooting your own missiles to take them out before they can do any damage. Upgrade/Repair points can be earned to upgrade your defensive weapons or repair damaged buildings. 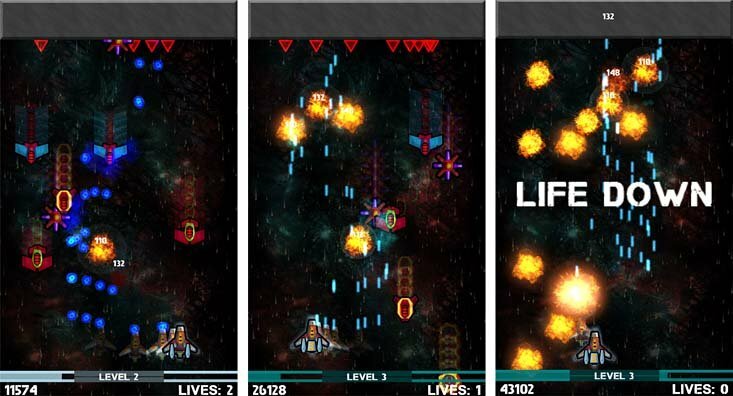 MissileDefender is a multi-level game that starts out slow but quickly picks up speed and can be really challenging. There is a free trial version available for MissileDefender with the full version running $.99. You can find MissileDefender here at the Windows Phone Marketplace. 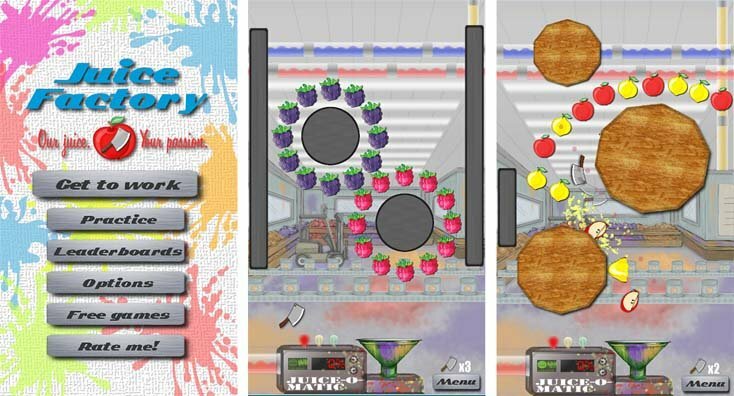 Juice Factory (Free): Juice Factory has been on the Windows Phone Marketplace for a little over a year and may qualify as a classic Windows Phone game. While the game has been around for a while, Juice Factory remains a challenging and entertaining game for your Windows Phone. Your job is to throw your meat cleaver around, slicing up fruit for the Juice Factory. You have a limited number of cleavers per level and you have to slice a certain percentage of fruit before you can advance to the next level. There are over 180 levels of play to Juice Factory so you won't run out of challenges any time soon. Juice Factory is a free, ad-supported game that you can find here at the Windows Phone Marketplace. Bike Mania (free): Bike Mania first hit our radar when our own Jay Bennett recommended it during one of our Windows Phone Central podcasts. Bike Mania is a motor cross game that calls upon you to navigate your bike over various obstacles and making it to the finish line without crashing. Sounds simple, right? The challenge is keeping your balance and speed up because your racing for the best time possible. The free version has ten levels of racing action and the full version has eighty levels. Throw in real-time weather effects, nice graphics, and challenging race courses and Bike Mania is a fun game to pass the time with. You can find Bike Mania Free here at the Windows Phone Marketplace and Bike Mania ($.99) here at the Marketplace. 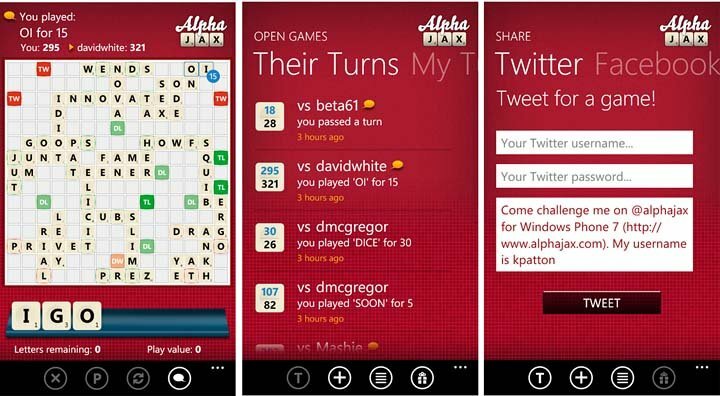 AlphaJax (free/trial/$2.99): AlphaJax is an online, turn based game of scrabble that is feature rich, fun to play, and just an overall nice game for your Windows Phone. You can challenge your friends to a game, let AlphaJax tap an similarly ranked opponent for you or you can Tweet out a challenge. The game itself is pretty much a straight forward game of scrabble where you have to build words from existing words on the game board using a selection of letter tiles. The game ends when all the tiles are exhausted and the winner is the player with the most points. You can take screen shots of the game, chat with your opponent, and battle for top ranking in the various leaderboards. There are two versions available for AlphaJax. AlphaJax Free is an ad-supported version and AlphaJax is an ad-free version that is running $2.99 (trial version available). You can find AlphaJax Free here and AlphaJax here at the Windows Phone Marketplace. Impossible Shoota (free): When you bring up independent developers Elbert Perez has to be in the discussion. With fifteen Windows Phone gaming titles and hundreds of thousands of downloads, Perez is one of many independent Windows Phone developer success stories. While all of his games are entertaining and challenging, we had to pick one and that was Impossible Shoota. 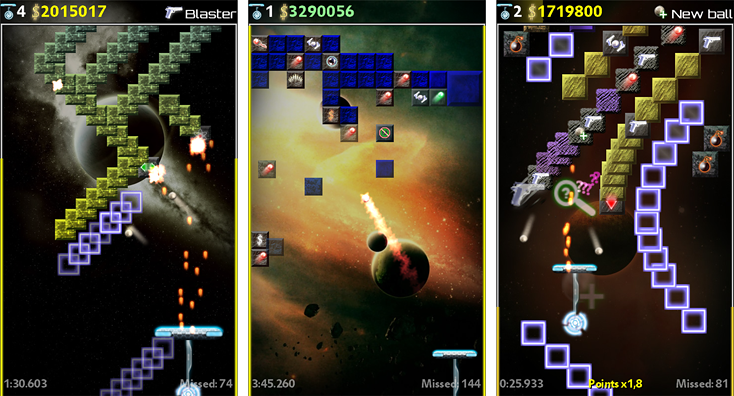 The space themed arcade game is about as fast paced as a Windows Phone can get. You face twenty-five different enemy ships that you have to shoot your way through. As you progress through the levels of play, the swarms of enemy ships becomes more intense and if you blink twice, they've taken out your ship. Impossible Shoota is a free, ad-supported game that you can grab here at the Windows Phone Marketplace. ARMED! (trial/$1.99): ARMED! is a turn-based, multiplayer, sci-fi strategy game for your Windows Phone. It may have the best gaming graphics available that matches up nicely with game play that is challenging and entertaining. You have three game modes where you can play against opponents online, play head to head with friends in a pass/play mode, or challenge the AI in a single player mode. ARMED! includes five gaming maps, twelve offensive and defensive units and fifty upgrades and special attacks to keep things interesting. Add Scoreloop integration and ARMED! becomes a very nice gaming package for your Windows Phone. There is a free trial available for ARMED! with the full version running $1.99. You can find ARMED! here at the Windows Phone Marketplace. So there you have it, a handful of recommendations on Windows Phone games from our independent developer community. As with any of our "best of" lists, if a title doesn't make the cut it shouldn't reflect poorly on that app or game. The Windows Phone Marketplace is full of quality games from our independent developers such as Rainbow Rapture, Logorama, Line Runner and Shuriken Ninja. To list them all would be create a post that would rival War and Peace in size. That's where you guys and gals come into play. If we've missed an independent title worthy of a recommendation, sound off in the comments.